In his latest video blog, Medvedev issued the toughest condemnation of Stalin's policies by a Russian leader in a decade. His rejection of attempts to "justify" repression raises questions about whether the Kremlin is taking a tougher line against partial rehabilitation of the dictator's image. President Medvedev's video blog condemning Stalin was issued on October 30, a day of remembrance for victims of Soviet repression. His historic commentary also counters a number of recent attempts to present Stalin's record in a positive light. Over the summer, Stalinist lyrics were restored in the Moscow metro, and textbooks calling Stalin "an efficient manager" were published. The Kremlin also launched a commission to study "historic falsification," particularly regarding the Soviet Union's conduct during World War II; this led to speculation that the authorities were increasingly worried about how Russian history, and Stalin in particular, was being presented. Medvedev's blog went online as hundreds of people were paying their respects to the millions who died under Stalin's terror. On Lubyanka Square, next to the headquarters of the Federal Security Service (in Stalin's time, the location of horrific interrogations under the feared NKVD), a Russian Orthodox priest led the memorial, while a similar service was held in Vladivostok, home of a transit camp that dispatched prisoners to other camps. The day has been commemorated nationally since 1991, and marks a day in 1974 when prisoners in the Gulag system of labor camps called for a day to remember all political prisoners. In his video, Medvedev appeared just as concerned as some Kremlin critics about the insidious movement to rehabilitate Stalin. "Let's just think about it: Millions of people died as a result of terror and false accusations-millions," Medvedev said. "But even today you can still hear voices claiming that those innumerable victims were justified for some higher national purpose. I believe that no national progress, successes or ambitions can develop at the price of human misery and loss. And there is no excuse for repression." Even so, the president was careful to draw a line between Russia's achievements during the period and Stalin's crimes. Medvedev attributed victory in World War II and the success of industrial modernization to the people rather than to Stalin. "Stalin's crimes cannot diminish the heroic deeds of the people who triumphed in the Great Patriotic War, who made our country a mighty industrial power, and who raised our industry, science and culture to leading world standards." Medvedev's statements stood out starkly amid an atmosphere in which some historians have complained of being denied access to historic archives and even of being accused of disclosing state secrets. But according to Sergei Markov, a State Duma deputy from the United Russia party, Medvedev's address was a clear indication "that there was no rehabilitation of Stalin and that there will not be one." The statements, according to Markov, were meant to reassure "the Western media and partially the Russian audience" that the Kremlin was not taking a pro-Stalin line. 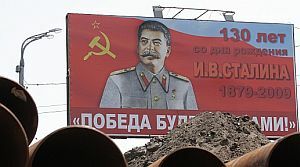 What had sparked concerns, he said, was the reinstatement of lyrics praising Stalin in the Moscow subway. "I would hope that Medvedev has recognized the danger of outright Stalinization, and he and his circle fear it may turn against them," said renowned human rights activist and chairman of Memorial, Arseny Roginsky. "Perhaps he did not understand earlier that the committee on falsification which he created would actually promote Stalinism. There is a chance that this statement will have an affect on local officials [who try to clamp down on Memorial's activities in the regions]." Medvedev's latest address raises a lot of questions about the Kremlin's current political direction, too, experts said. "He is trying to set a political trend, but he has done this before and it doesn't look like a successful move," said Rostislav Turovsky, a professor at the Higher School of Economics and the Center for Political Technologies. "But not many agree with him [on this]. It doesn't strengthen his position in his duet with Vladimir Putin, because it will not help him with a constituency. It's a narrow view, given the unpopularity of liberal views in Russian society, and Putin could easily override it."